Stop blisters before they start! 2SKIN prevents chafing! Does your chest strap chafe? Do your new hiking shoes rub or did you get another blister while running? Enough is enough! You can prevent these injuries with 2SKIN. Simply apply for effective protection. What’s more, 2SKIN does not stain, it is dermatologically tested and can be used with functional sportswear fabric and wetsuits. 2SKIN is suitable for daily use and provides ultra long lasting protection, even under harsh conditions. Find out for yourself! Problems with blisters and chafing? It’s a common complaint for runners, triathletes and all other sports enthusiasts: Just as you get into your stride, you start to feel chafing either from skin rubbing on skin or clothing rubbing on skin. The longer you run, ride or hike, the worse it gets – leaving you with blisters and open wounds that stop you achieving your goals. 2SKIN can help you reach your goals! Simply apply a thin layer to the areas of skin you want to protect before you start your training session or activity. It immediately forms an invisible, breathable and extra-strong protective film that is resistant to water and sweat and lasts an extremely long time. Achieve your goals! Without any pain! The protective film prevents any friction on your skin. 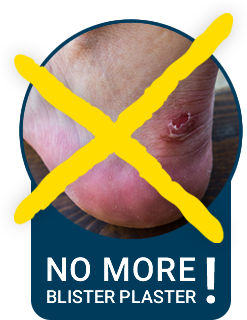 2SKIN eliminates any risk of chafing, whether it's from clothing, shoes or your own skin – making open wounds and blister plasters a thing of the past. Many people simply accept blisters and chafing as part of life and use blister plasters to treat these open and very painful wounds. Usually, the results aren't ideal. Blister plasters are highly visible and not resistant to water or sweat. They peel off and can become another source of friction and skin damage. Blister plasters are also expensive. 2SKIN costs less than EUR 0.01 per application (2 x 2 cm). A blister plaster costs around 80 times more on average. Now, you can put an end to all of this. 2SKIN stops blisters and chafing before they start! The seal shows consumers that products with this award do not contain any animal-derived ingredients and that the products have not been tested on animals. Subscribe now to our regular 2SKIN newsletter and be the first to be informed about new articles and offers. The newsletter can of course be cancelled at any time via a link in the e-mail or on this page. Outstanding skin compatibility and quality are at the heart of everything we do. This is our promise to you! All of our products are subject to numerous quality tests. These are carried out internally and externally, by organizations and customers, and we are very proud of our excellent track record here. Try out our products and make up your own mind! Can I apply pjuractive 2SKIN to all areas of skin? 2SKIN can be used on all areas of skin. After all, depending on physical activity and the sensitivity of the skin, every individual can suffer chafing and blistering on different parts of the body. Does 2SKIN stay smooth at any temperature? pjuractive 2SKIN offers effective protection between -30C° and +60C° against blisters and chafing, because the composition of the formula remains stable and doesn’t change under extreme external or temperature conditions. Is one application of pjuractive 2SKIN enough? One application of 2SKIN to the relevant areas of skin is normally sufficient. A single application guarantees the desired protection. However, the protective film can be reinforced by multiple applications of 2SKIN. For long distances or long training sessions, we at pjuractive would definitely recommend multiple applications of 2SKIN. Can pjuractive 2SKIN also help if I already have skin irritation or blisters? 2SKIN is designed for prevention during training or competition. It does not help to soothe existing blisters or skin irritation. "As a passionate trail runner, I always use pjuractive 2SKIN when I'm covering longer distances. It offers real protection against chafing especially for my feet, legs, chest and armpits. It's totally reliable and I'd recommend to everyone!" "Particularly for long courses of more than 30 km, 2SKIN from pjur active is an essential item for us. Simply apply to any areas where chafing might occur before your run and you're good to go. You will be carefree and able to concentrate all your energy on the route and the landscape, as nothing will be causing you pain in your shoes or under your clothes. Phenomenal! " It's the perfect supplement for sports and everyday life! pjuractive BODY AFTER SHAVE Spray provides gentle, soothing skincare and effectively combats razor burn and skin irritation after shaving. It has been specially developed for daily use when shaving part or all of the body. It can be used by men and women and does not contain any alcohol or perfume.